Categories: Haiku, Micropoetry, Photos, Poetry, Three Line Poetry | Tags: Photos, Poetry, SL-Week | Permalink. Thank you! It’s not for everyone but I can’t live without it. Thank you. I am looking forward to RED! Hello comfortable mermaid. Lovely portrait, DE. Thank you. 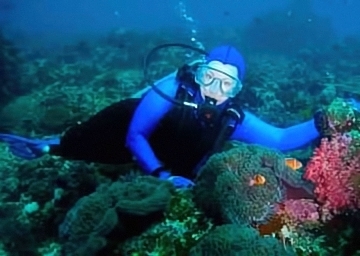 The reality of the shot is that I was being attacked by a very territorial Tomato Clown fish. He did not appreciate my mass being near his anemone. I did not notice the general discomfort of either of you. My bad. I think by that point my laughing had shamed him.